Welcome to Our New Oblates! 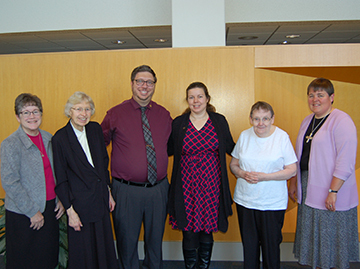 Welcome and congratulations to our new oblates, Daniel and Priscilla Bar, and Mary Lund. They made their oblation during Eucharistic Liturgy on Sunday, October 8, 2017. We are truly blessed to have you with us. May God bless you each day on your faith journey. *Oblates are women and men of varied faith backgrounds who wish to live according to the Rule of St. Benedict, supported by a monastic community. Our oblates are supported by the prayers of the sisters, monthly meetings and retreats, and through spiritual reading.